4 Outdoor Kitchens - Beautiful Designs that Enhance our Outdoor Living! "Nothing says summertime like cooking and eating in an outdoor kitchen"
This pool house outdoor kitchen works as a place to cook outdoors while enjoying the pool and a place for guests to enjoy a quick bbq. This full outdoor kitchen is complete with fireplace. This Free-Standing, Covered Outdoor Kitchen is a destination in itself with a pizza oven and a full kitchen to create amazing meals by the pool. The working side of this outdoor kitchen. We set this kitchen into a stone hillside below a guest bedroom. The bedroom has a walkout porch that includes a stone chimney and a great view of the woods beyond. The outdoor kitchen is covered and not too far from the main kitchen. "I love pergolas. They give shade and add detail and interest to any structure although, I have to admit, there is no pergola which is perfect for all situations." We sometimes create free-standing pergolas, however most are connected to a home or outbuilding. Materials for posts and beams can either match the larger structure or be completely different creating a contrast. If plants are allowed and encouraged to grow over the structure, care should be taken to choose durable materials and finishes. If the pergola is to be painted, vines may need to be cut back for maintenance. When designing a pergola, it is critically important that the structure be able to withstand the loads of vines covered with ice or snow as-well-as the forces created by crosswinds. We always have an engineer check our designs for structural capacity in the worst weather. In addition to providing shade, a pergola can create an entrance or emphasize a path. A garden entry is a perfect spot for the perfect pergola. As we roll into Fall, you may find yourself building more bonfires, roasting s’mores with the kids, and sitting on your porch with the heater on. Many of these projects include indoor-outdoor spaces which are ideally enjoyed in the fall when an outdoor fire can be appreciated or simply a moment to be outside before it gets too cold. Outdoor fireplaces are a great source of warmth and entertainment and if you combine that with a screened porch, you have it made. To bring the outdoors inside, a wall of accordion glass doors can move aside and open everything up. A three-season room with radiant heaters in the ceiling allows for maximum flexibility while a roller screen keeps the bugs out. Make the most of the Fall season, then do it again in the Spring. Sometimes all you need is a little shade while sitting around the pool. That is especially true if the pool is close to the house or other buildings with bathroom and changing facilities. On those very hot days, a quick dash into the shade can make the perfect day even better. Living through the seasons in the Northeast reminds me of my daughter's favorite book as a child: Going on a Bear Hunt where the father, the kids and the dog go looking for a bear and when they find one, they run home through the snow storm (Hoooo woooo), the forest (Stumble trip), the mud (Squelch squerch), the water (Splash splosh) and back through the grass (Swishy swashy). They then run into the house (without wiping their feet), up the stairs, into bed and under the covers with the bear looking through the window. I’m sure that having a mud room to shed the wet and muddy layers would have made mom happier when she came home. 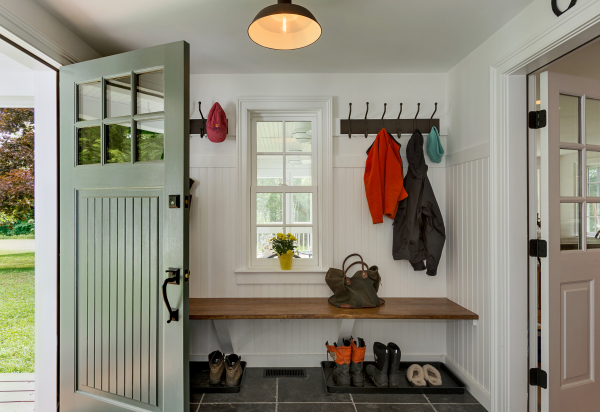 Just about every home we design includes a mud room which is good for keeping bears out, but more importantly provides a place to take off boots and coats and leave the mud and slush behind. Mud rooms are also the primary place for organization of outerwear for future excursions. More elaborate spaces include slop sinks for cleaning gear and storage space for sports equipment and even sometimes a dog grooming area. Some layouts also work as an airlock to the rest of the home. The basic requirements include a non slip, water resistant, durable floor. Walls and cubbies should be made of a rugged material such as wood with plenty of room to hang coats and store boots, gloves and mittens. Occasionally we will add a center drain to the floor for easy wash down (make sure the baseboards are waterproof). A bench with or without a hinged seat top is required for putting on and taking off those extra tight boots. Near the ceiling, a long shelf comes in handy for hats and other paraphernalia. Even though the mud room can be the smallest room in the house, from its organizing capacity to the impact of a cleaner home, this little room earns its keep.